The knife arrived a day early and I am impressed! It has "everything you need and nothing you don't". 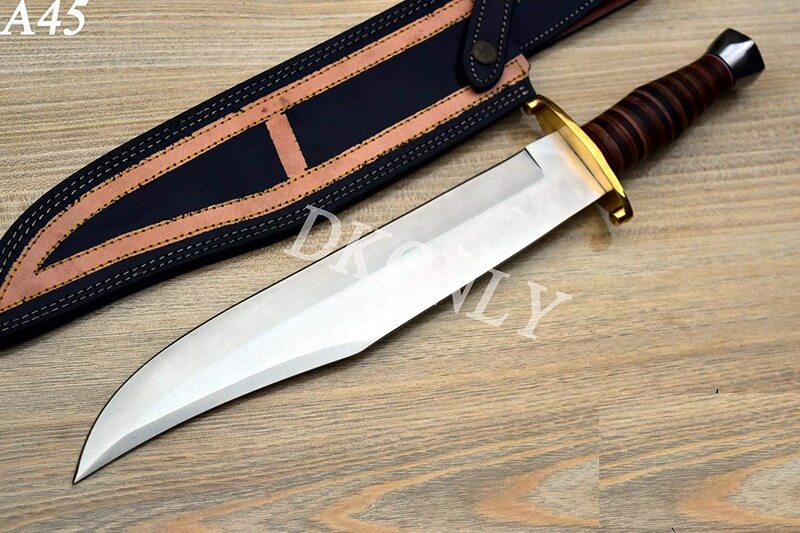 The clip-point on this Bowie is "tougher than whip leather" and is surprisingly light. Fast in hand, with a .25" spine. Brute strong, but "shaving sharp". Trust me, this one is a "keeper". Ian: You need a new Bowie knife to go with the rest of your cutlery. Speak to me and let me know how we help. It will be here on Tuesday. Yes, I am absolutely positive that this knife will be a favorite. I can see the headline... "Distraught Veteran slays violent crackhead. Film at eleven." It arrived today, sharp enough to slice, and dismember any opponent.The only thing I'll change is the brown piping on the sheath. (I'll be dyeing it black). This will be a versatile 10" bowie blade of 1075 Carbon Steel that will fill a niche in my collection. This one has a 12" blade that has been "vacuum quenched" so that the D2 steel will attain a Rockwell hardness of 58-60. ("Crocodile" Dundee would love this one). Topic: DK ONLY Knives? (There's a picture link in my latest post). Bill: That's the way more Leverlettos should be built. Could you suggest this to the people in Italy? It would make the pocket carry of smaller Leverlettos more convenient and popular.